Over the years, thanks to some creative, unusual talmidim I was privileged to teach when I was a mesivta Rebbe, I have had an assortment of pets (the animal sort). Each of several Purims, my shiur would give my wife and me, in addition to mishloach manos, a living gift. We thereby became the proud caretakers, at various points, of a goat, an iguana and a tarantula. In addition to the tropical fish we’ve always kept, and the occasional hamster or mouse one or another of our children cared for. I honestly appreciated each of the creatures; they evoked in me amazement over the variety and abilities of Hashem’s creations. Likewise, the birds and squirrels outside our dining room window during breakfast are an endless source of beauty (and, even sweeter, needn’t be fed). My wife is particularly partial to the graceful deer that sometimes venture from nearby woods to visit. But animals are animals. Not, as some increasingly assert, beings less sentient than us but no less worthy of being treated as human. The more than two thirds of American households that own pets spend more than $60 billion on their care each year, up sharply in recent years. People give dogs birthday presents and have their portraits taken by professional photographers. According to at least one study, many Americans grow more concerned when they see a dog in pain than when they see an adult human suffering. That’s bad enough, but the law, too, is being enlisted to obscure the bright line between the animal and the human spheres. Last year, the Illinois legislature passed a law that would force courts to give “parents” joint custody of pets in divorce cases. “It sort of starts treating your animal more like children,” says an unembarrassed Illinois State Senator Linda Holmes, the bill’s sponsor. The nonprofit Nonhuman Rights Project promotes the idea that animals should be entitled to the right to not be unlawfully detained without a judge’s order. 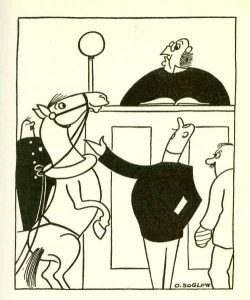 Habeas corpus for horses. We who have been gifted with the Torah, as well as all people who are the product of societies influenced by Torah truths, have no problem distinguishing between animals and human beings. But some secularists reason that, since animals have mental abilities, if limited ones, they should be treated like human infants. If such people’s minds are open even a crack, though, they should be able to realize that considering animals qualitatively different from humans isn’t “speciesism” but a truth born of observable facts. Yes, animals think and communicate. But conceiving or conveying abstract but important concepts like “right” and “wrong” and “responsibility” and “wantonness” – is something quintessentially, and pointedly, human. Humans, moreover, have what philosophy calls moral agency, the ability to choose to act even against instinct. In a recent conversation with an eldercare professional, I pointed out something she had never considered. Seen through a secular lens, biological species are “interested” only in preserving their own lives and those of their progeny; their behavior (consciously or not) serves the biological goal of the species’ perseverance. The previous generation has no value; it has served its purpose. Animals care only for their young, not for their parents. Humans, though, at least in normal circumstances, feel an obligation to care for those to whom they owe their lives. It will have to be seen whether or not such compelling distinctions will put brakes on the misguided idea of a smooth animal-human continuum. And, if it doesn’t, whether those who see animals as human (and vice versa, the inevitable other side of that counterfeit coin) will be able to enlist lawmakers in their goals. More than we might imagine will hang on it. Next story You Know Who Isn’t Abandoning Israel?